Mary Medrano, a local contemporary artist, is self-taught and works intuitively. 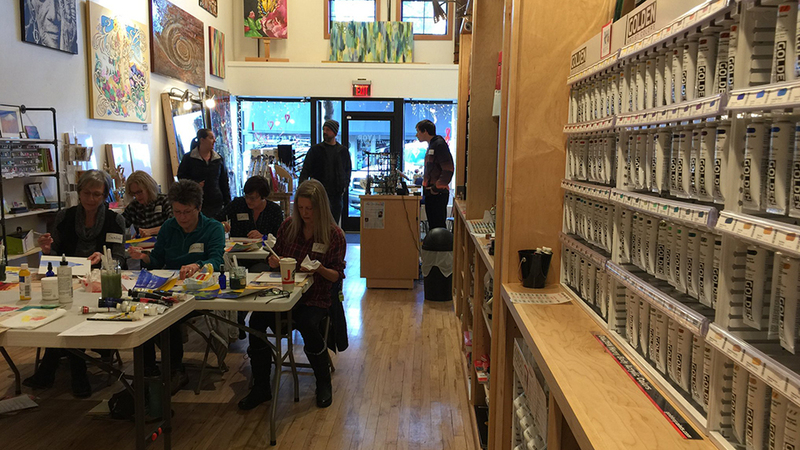 Her downtown studio overlooks Tin Pan Alley, and is where she hosts Bend Painting Parties, social painting events that bring people and painting together in a fun, creative gatherings of up to 12 people. She is also well known for her evocative pet portraits of people’s treasured animals. She works with a variety of new and recycled materials including acrylic paints, oil pastels, paper, photographs, fabric, graphite and ink. Her style varies, with abstracts, the commissioned portraits, and one of her favorite subjects: birds. She says “I am inspired by nature- birds in particular. Their behavior is entertaining. Sometimes they are mysterious. Often they are brave and bold. They inspire me every day.” In addition to her group events, she also provides private critiques, painting lessons and drawing lessons for $35 an hour. Her work has been included in many shows, museums and exhibits throughout the US and in Italy, and she is a generous supporter of local non-profits through art donations.